Education for Rural People: Conference on "Knowledge and Food for All: Education for Rural People"
The event, organized by the Research Center on International Co-operation of the University of Bergamo, within the FAO- led Education for Rural People (ERP) Partnership, was held on October 10th, at Sant’Agostino Seat of University of Bergamo. It was included in the “Collateral Events of Bergamoscienza, X edition”. The seminar addressed the interdependency between some of today's main challenges to sustainable development such as hunger, poverty and rural development in least developed countries, and education for rural people, and the role of women, with a focus on microfinance. 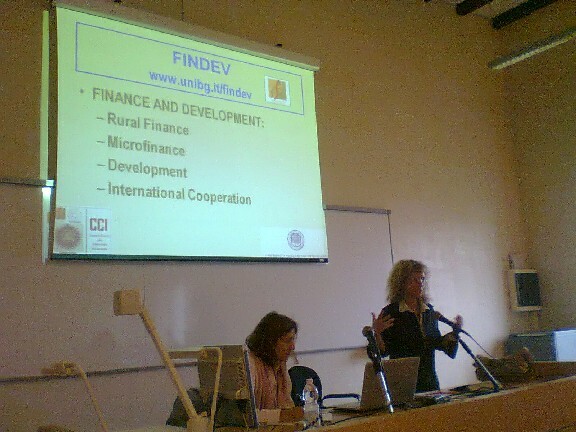 The speakers were Dr. Lavinia Gasperini, Senior Officer, Agricultural Education, FAO, and Prof. Laura Viganò, Director of the Research Center on International Cooperation, University of Bergamo. First, prof. Viganò introduced the organization and activities of the Research Center on International Cooperation (CCI), consisting of three research groups: a UNESCO Chair on Human Rights and Ethics of International Cooperation; the Finance and Development Group, committed to research on rural finance and microfinance; the Research Community “Raimond Panikkar” on Culture, Religion, Rights, No-violence. Dr. Gasperini, then, presented the main challenges and responses to educating rural people. Finally, prof. Viganò, an expert on rural finance and microfinance, gave a presentation on microfinance and its role for development. She argued that microfinance (MF) is a recent term but the current microfinance movement stems from ancient roots. In microfinance, the clients are the so called “active poor”, i.e. poor with entrepreneurial abilities but hardly served by the banking system because too costly to serve: small size financial products and high transaction costs often make financial break-even impossible for banks. Past attempts to provide financial resources in the form of loans to rural areas in many Countries failed due to a wrong approach of channeling funds through public banks not involved in the decisional process and not given enough responsibility, and due to the false assumptions that rural borrowers needed standardized products. Microfinance is often presented as the alternative way of offering financial products to rural areas in a more efficient way. However, Prof Viganò, while emphasizing the undeniable role of MF, focused on some key factor for its success: reliance on local financial resources, care about the customer’s characteristics, a flexible approach in products offer and delivery together with appropriate education and training, may help successfully serving the customers while preserving sustainability. In fact, the trade off sustainability-effectiveness of MFIs is still a challenge. Prof. Viganò also asserted that MF is not a panacea for poverty alleviation but that MF can be beneficial only if opportunities for investment, although small, exist. In this respect, Business Development Services can indeed play a special role in easing the microfinance constraints and enhance its effectiveness. In particular education and training can perform a complementary function to MF, allowing for better use of financial resources and higher awareness on the content of financial products, even the new potential ones like weather insurance.